As I write this, the country seems to be gripped in election fever… something that Sergio Scorpioni, president of Vallerosa is dreading. However, unlike the UK, the tiny country hidden somewhere near Italy is ruled by a voluntary dictatorship; the government granted rule through familial responsibility – ministers take up the role of their fathers who were granted office by their fathers, and their fathers, before them. The world turns slowly in Vallerosa, and as the government awaits its re-election a letter arrives from England. This letter will change the world of Sergio and his ministers, and will have a far reaching impact on the country as a whole. Seni Glaister has written a beautiful, joyful and thought provoking novel that pokes gentle fun at the establishment, and makes us think about the important things in life, such as moving forward with hard work, respect and humour, and the beneficial qualities of a good cup of tea. This book was sent to me as part of the Curtis Brown Book Group, and is one of my favourites so far. While some people thought that the first few chapters were slow, I actually enjoyed the gentle pace of the book. This is not a book to be rushed! As the story opens we meet Remi-Post, the country’s postman, as he goes about his business and finds that rarest of rare prizes… a letter bearing a foreign stamp. We soon come to realise that Vallerosa is almost invisible on the map and moves at a pace far removed from the hustle and bustle of the modern world. Unfortunately the sharks are circling in the form of an American consultant who has been slowly wearing down the resolve of the president and his men, as they turn their attention to exporting the country’s most valuable asset, and national symbol, tea. Tea features large in the book. It’s the national drink, no meeting starts without a tea ceremony, the tea plantations are the main crop produced (as the American consultant is only too aware), and the population thrives by drinking it. It serves as a beverage, but also as a link to tradition, a sense of identity and a way of life. When Lizzie, a British student, arrives in the country she adds a little honey, and starts a chain reaction that flows throughout the book. I daren’t say more for fear of spoilers but I can say that this book has been well received among the book club members and the overall opinion seems to be that the novel is joyous. I totally agree. Seni has developed a wonderful place and the only criticism I have is that, for me, the story ended too abruptly, but that is probably because I wasn’t ready to say goodbye to such a brilliant cast of characters. If you are after a book that has the ‘feel good’ factor I would urge you to pick it up. 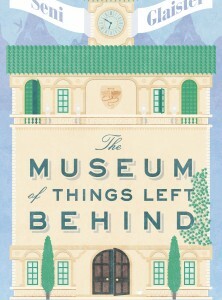 And as for the museum in the title?… you will never look at a discarded biscuit wrapper in the same way again. You know Iain, I never thought of that… but yes, I can totally see where you are coming from!